It can be an exciting time when you’ve got a brief and have the support from the business to create a training video. Before getting carried away it is vital that pre-production (planning) is given as much focus as production (filming) and post production (editing). The work dedicated at this point will make the process easier when you get on to set and you will feel confident when you are directing anyone else involved in the project. Before grabbing the camera and heading to set you want to complete a call sheet, as it’s known in the film industry. If planning a video learning project is daunting looking at a call sheet can give you a good indication of the areas to consider before moving into production. I’m sure this is self explanatory! The shooting day this call sheet relates to. Otherwise known as call time and wrap time. This should be the entire days filming, if you require people at a certain time this will need to be specified in the talent list. Where the filming is taking place, be specific. If you have people turning up throughout the day you don’t want to be disturbed in the middle of a take because someone can’t find you. This is vital if it is an exterior shoot. You may not think it is relevant if you are shooting indoors, bear in mind the weather will effect any natural light that you were hoping to use. This information could be a useful guide to help decide what additional lighting is required. This isn’t essential, but personally I believe it’s a good reminder and can help everyone keep focused on the overall goal. Before planning any filming you will have scoped out what content is essential and the elements required to get this across. This breakdown could have been presented in a storyboard and/or script. This section references the elements which will be shot. When you arrive on location you want to set the camera in the first setup and then record every shot whilst in this spot. I would recommend starting with the Establishing Shot (ES) and/or Wide Shot (WS) as this provides an opportunity to run through the action without there being too much focus on one particular item. A shot list can be created from the storyboard and / or script and provides a break down of how you plan to film each element. It is very rare that a video is recorded in its correct order and you may jump, for example, from scene 1 to scene 5. 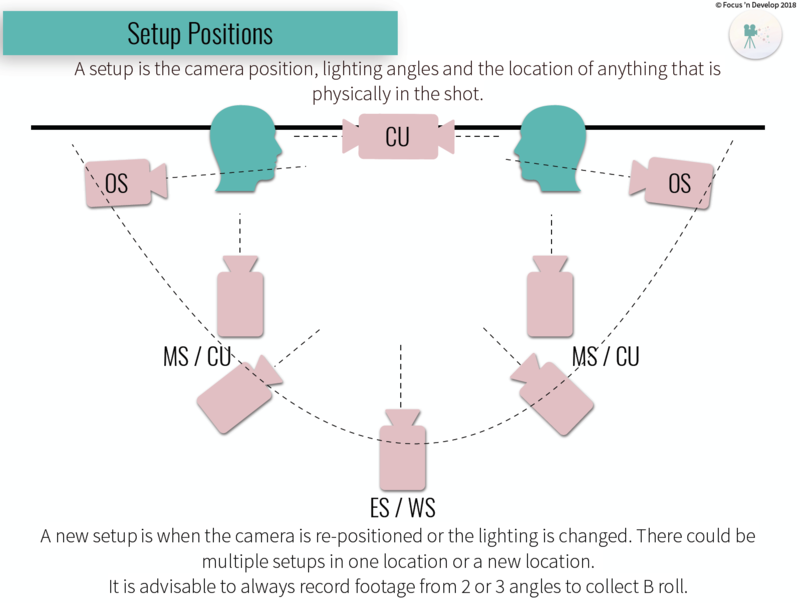 Your shot list will help you identify what needs to be captured whilst in this setup. This will help you decide on lighting and other equipment required. As above, but could also effect access to certain areas within the location or parking. A summary of what is going to happen in the shot. This could be a Static position or Zoom or Pan. Who and/or what is needed for this setup. This will establish the call time for the talent. Characters name or the role that they play, for example, Factory Operator Number 1 or Customer Number 3. For obvious reasons, you don’t want to call a person ‘Factory Operator Number 1’! Although I have seen it done before. What time they need to arrive. If you are a single person crew then allow yourself time to setup before the talent arrives. If there is a small crew, one person could start to direct them whilst the others setup. Reference the relevant setup so the individual is aware which scene, shot and action is required from them. Not always relevant, but could be helpful so the talent can prepare. Treat your props like a talent of their own. What time do you need that prop, for example, what time will you need to be at the production line or will you need the coffee machine? Will this affect the normal running of the business? Very easy to forget in small productions, but could be helpful if you are filming the same scene over a few days. This should include names, roles and contact details of the key people who are working on the project. This could include any additional information, such as parking and health and safety considerations. By considering these areas at this stage of your video learning learning project when you arrive on set you can focus on the message that is being delivered and ensure that the learning objective is met.